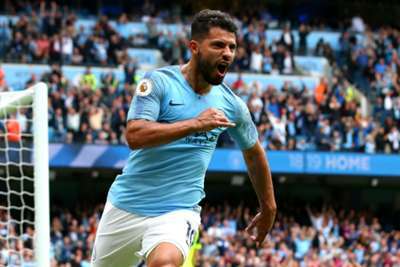 Sergio Aguero registered his 13th hat-trick for Manchester City as the reigning Premier League champions showed they were not missing Kevin De Bruyne in a 6-1 thrashing of Huddersfield Town. Aguero got City's first, third and fifth goals, while Gabriel Jesus and David Silva, on his 250th Premier League appearance, also beat Huddersfield goalkeeper Ben Hamer. It was a reminder from City and Aguero that they can cope without Belgian playmaker De Bruyne, who suffered a knee injury earlier this week that could rule him out for up to three months. The last time City beat Huddersfield at home in the league, in 1987, they scored 10 and after 35 minutes on Sunday the reigning champions were 3-0 up. The 25th-minute opener came from Ederson's 70-yard goal-kick as he spotted Aguero in a one-on-one situation, and City's all-time scorer stayed cool to chip past Ben Hamer. Jesus added a second six minutes later following good work from Benjamin Mendy and when the Frenchman delivered a cross that Hamer fumbled, Aguero accepted the gift to score City's third. The only negative from Pep Guardiola's perspective was that Huddersfield pulled one back prior to the break as Stankovic capitalised when Steve Mounie flicked on a long throw. Yet the three-goal lead was restored within three minutes of the restart when Silva bent a beautiful free-kick into the top-right corner as Hamer stood motionless. An Aguero hat-trick looked inevitable – he had already hit the post and narrowly missed the target by the time he flicked in Mendy's glorious delivery 15 minutes from time. The striker was taken off straight after that but his replacement Leroy Sane was involved in City's final goal when his attempt was saved by Hamer but went in off the unsuspecting Kongolo. FULL-TIME | A mesmerising way to open our home campaign! De Bruyne's expected three-month absence is a blow but City once again proved they are far from a one-man team. Aguero and Silva were excellent and Mendy, who barely featured at all last term due to a serious knee ligament injury, offers Guardiola's side another dimension. City fans might have been wondering who was going to provide the assists without De Bruyne and surprisingly it was their goalkeeper who claimed the first in this victory. Ederson has been lauded for his ability with his feet but he displayed fine vision too when he dropped a glorious 70-yard goal-kick into Aguero's path. - Huddersfield have conceded nine goals in their first two matches this season; only one side in Premier League history has conceded more goals in their opening two games – Wigan Athletic in 2010-11 (10). - City have now scored 104 goals in 39 games at home under Guardiola in the Premier League. - Silva's strike was his first ever direct free-kick goal in a league match in any of Europe's top five divisions. - Aguero has now scored nine hat-tricks in the Premier League (level with Robbie Fowler). Only Alan Shearer (11) has managed more than the Argentine in the competition. Huddersfield needed their own goalkeeper to be in top form if they wanted to get anything and Hamer hurt rather than helped their cause in the first half. His blunder in failing to collect Mendy's cross for Aguero's second was inexcusable, while he made no attempt to get across to Silva's free-kick for City's fourth and could have done better up against Jesus. City face the three newly promoted clubs in their next four games, starting with a trip to Wolves next weekend. It is one of last year's Championship sides next for Huddersfield too as they entertain Cardiff City.